For a long time, Nikon has been active in the optic markets. They are famous for their non-hunting and camera optics. However, over the past years, they have been steadily making a push into the sporting and hunting optics market. One of the riflescopes that leads this charge is the Nikon Monarch 3 4-16×50 mm Riflescope. With its state of the art features, this is a good medium-range riflescope that hunters can use when stalking big game. 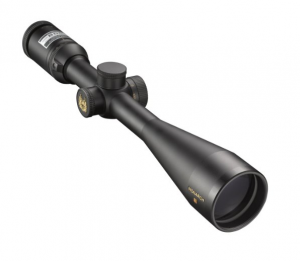 The Nikon Monarch 3 4-16×50 features a single piece body made of aluminum that is common in many high end riflescopes. With a weight of only 20 ounces, this is a very light scope for the amount of magnification that it offers users. It is not very often that a person will find a scope that only weighs 1.25 pounds with 16x on the high end. This makes it a great option for hunting at long range. It also has a length of over 15 inches. This is very compact and is almost three inches shorter than other high end scopes on the market today. Each moving part on the Nikon Monarch 3 is up to snuff. The magnification and focus rings function perfectly, and there is no grinding. The side focus has a push-pull locking mechanism that delivers some additional value. The turrets function well, and people do not need a tool to reindex the turrets. The optical quality on the Nikon Monarch 3 4-16×50 is very good. Chromatic aberration is very well controlled at any magnification and is actually less at higher levels. This is very surprising as similar riflescopes have chromatic aberration that gets worse when the magnification is increased. This is made possible through its sunshade adaptable feature. What is even better is that this also helps in keeping rain and dust off the objective lens in dusty environments and on rainy days. The massive 50 mm ocular lens has an Ultra ClearCoat Optical System that provides the shooter with sharp and bright incredibly flat sight picture and light transmission up to its theoretical maximum of 95 percent. It is the reason why users report that this riflescope’s clarity goes all the way to the object and has no blurriness all the way to the edge of the sight picture. The inclusion of the flip up covers on the ocular and objective lenses are a nice touch. This flips up effortlessly and closes securely with a single finger. It also has a side focus dial that is easy to reach and allows people to quickly focus from a shooting position. At the same time, it has enhanced mount ring spacing that provides mounting on virtually any rifle action regardless of the caliber. Unlike other riflescopes out there, the Nikon Monarch 3 4-16×50 also includes a large cleaning cloth. The Monarch 3 has interchangeable turret technology as well. It can be customized with accessory target-style elevation and windage adjustment caps and knobs. It also has the unique Monarch 3 Eyebox Technology to protect the shooter’s face. This riflescope also has smooth zoom control as well. The magnification reference numbers are viewable from the shooter’s position. This enables people to make quick and precise adjustments while in the field. All in all, there is a lot to like about the Nikon Monarch 3 4-16×50 mm riflescope. Clear and bright glass, wide magnification range and great features are some of the reasons why this is one of the best riflescopes available on the market today. With this riflescope in their hands, shooters can stalk game accurately and effortlessly in any weather condition.